Postcard NL-2072836 arrived today with a view of the Hollum lighthouse, located at the westernmost part of the West Frisian Islands in Ameland, the Netherlands. 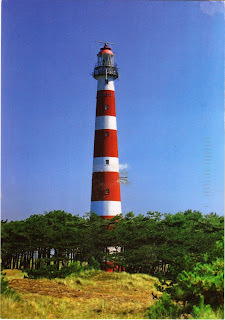 The lighthouse, 59 m or 194 ft high, was built in the 1880s. Next to the Ameland is the island of Terschelling where "Oerol", a Frisian summer festival, takes place every year in June. The festival lasts for 10 days and highlights live, public theater as well as music and the visual arts. You can find many pictures of the Hollum lighthouse at Flickr Hive Mind.